Virtualization – What is it? Virtualization is the process of creating a logical (virtual) version of a server operating system, a storage device, or network services. Server virtualization is the segmentation of a physical server into logically distinct and separate virtual machines in order to maximize physical server resources. 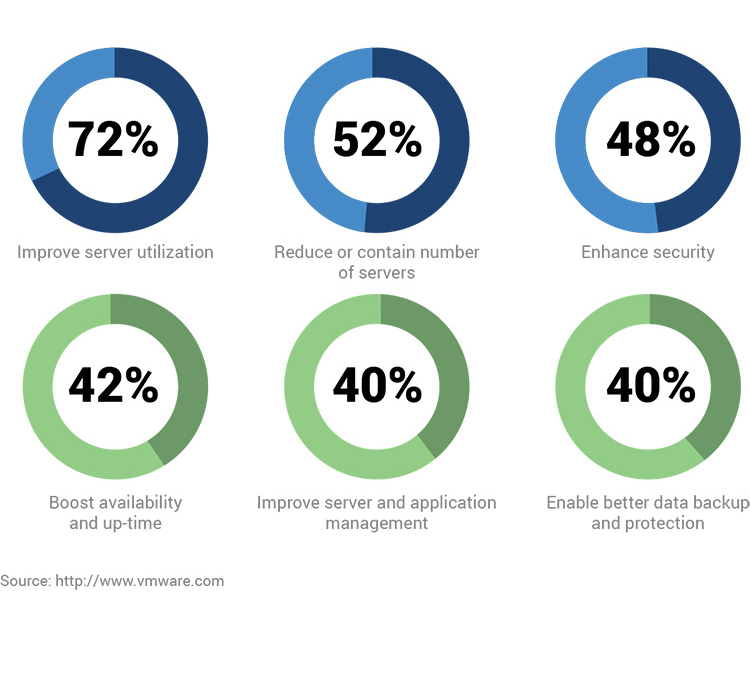 The optimization of physical server resources, increased performance and reliability, and faster data recovery are just a few of the many benefits virtualization provides. This is in contrast to dedicating one physical server to a single application or task. Servers today are outperforming models of years past. Because of this, it is very likely that your physical servers are being underutilized. Modern Data can consolidate your servers and maximize your server efficiency. Virtual servers can leverage live migration technology (the ability to move a virtual server from one physical server to another transparently and without an outage). Doing so will ensure there is no impact on the end user when maintenance or other work is required. Physical servers are often shared by different workgroups. Reconfiguring the server for a new or different operating system is very time consuming and labor intensive. Conflicts are inevitable when sharing the same operating system instance. If you have servers that are performing poorly, through server virtualization with Modern Data, you can migrate data onto new or existing physical servers easily. This saves your company time and decreases outages and downtime. Modern Data can help you optimize multiple applications living on one of your servers – allocating resources where they are needed most.